Of course, customs of different countries are strange if one is not used to it. Even more when it comes to traditions connected with religion. When you decide to spend your life with someone from the other side of the earth, you will at some point end up in a religion related situation where you are lost, and will feel just out of place. For example when it comes to funerals. Funerals in Austria are normally split. Firstly, we have a small service at the laying-out of the deceased. Although the coffin is not open and you cannot see the body, it is still possible to say good bye for a last time before the body is taken away. Some days later, there is a second service at the cemetery when the person is buried. The family members can decide who can take part as both ceremonies as they can decide whom they will send an invitation, or if the news about the pass away will be made public. Yesterday, Mr.Panda and I visited the laying-out at my grandma’s old hometown. As my grandma was a little religious, my mom asked the local catholic pastor to hold a short mass. The pastor exerted himself to make it very personal and he did a great job. And as expected we need to pray the classics: “Our Father, who art in heaven”, “Ave Maria”, lots of intercessions and everything else that the Catholic Church came up with. Of course it was easy for me to follow as I was drilled in elementary school’s religious education back then, which counted as normal basic education for children growing up in the countryside with only Catholics around. Mr.Panda was visibly struggling was he could not follow what the pastor was praying at all, but he did a great job and just sat it out. Only then I realized that he might not have any religious education before as his parents are Buddhists and he might have never attended religious education classes at all. Of course he not joining the prayers did not matter at all, and to tell you the truth, my mom told me later that she was impressed that I knew what was going on. As for Mr. Panda, she also understood that he might have felt lost and was glad that he could manage the situation. I, on the other hand, was amused, because while watching him I remembered that I also forcibly had to pray at shrines and temples before too – and that I also was confused and did not know what was going on at all. In the last years I piled up quite a nice collection. This was the first time Chinese grandma took me to pray at a Buddhist temple. I did not know what was going on, had to burn incense sticks, kneel, bow, clap, and then all was over. I was left behind bewildered and probably a little bit holier as I was before. When we went to Chinese dad’s house of birth, Chinese grandma wanted to pray at her old temple. Once again, she forced invited me to pray with her again and burn some incense sticks. I liked the incense basin with the dragon in front of the temple. Unfortunately, it was not the correct temple, and I when we found the correct one, I had to repeat the same procedure again. At least she was happy that she made us lucky for some time again. Nameless temple No. 2 was the correct one. When she wanted to pray again at another temple, I fled and looked for a place to take a good photo. Mission accomplished. Nameless temple No.3 where I almost had to pray again. Last year, I was forced to take part in a short Shinto praying. Japanese Shinto shrines sell small wooden plaques, called “Ema”, were you write your wish on. They sold them with Daruma, Japanese wishing dolls, on it, and I wanted one so much. But to get one, you had to take part in a short Shinto praying ritual. Of course I did because I wanted it so much. I had to kneel, bow, and I was even hit with branches by the Shinto priest. Once a little more holy and bewildered again, I got my Ema. After hit with branches I got my Ema. These are at least the ones I can remember. There might have been a few more Shinto shrines I visited in Japan with my friends. I followed their orders as well as the ones from Chinese grandma and the Shinto priest, although I felt out of place and did not know what was going on. Have you also already prayed somewhere although you did not know what was going on? How did you feel? I would have no idea what to do at a temple. Most Christian churches are easy to figure out and follow, though, even though I’m an atheist. But oh! The Catholic wedding mass! I went to one one crutches when I had a torn quadriceps muscle and I thought all the standing, kneeling, and standing again might kill me. I was perhaps hoping it would kill me and put me out of my misery! I am also an atheist, or rather an agnostic. I was surprised myself that I still could remember all that long prayers. But at temples… I still do not know what I am doing. 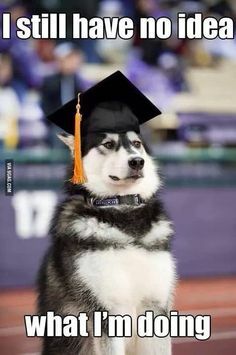 I am like this husky with the university graduation cap meme who doesn’t know what he’s doing. And I am so glad that most of my friends do not marry in a church anymore. As I told my mom at the service: When there are no old people anymore, the young ones will not know what to do and what to say. Maybe. But I hurt myself stupidly and therefore hated the idea of drawing attention to myself. I also have never prayed alone. A Chinese lady almost forced me in Chinatown in Yokohama, but fortunately I could flee. Actually I have never visited the graves of Mr.Panda’s relatives in Hong Kong, they all have these little shrines at home. But when I think about it, he also never visited the graves of mine.